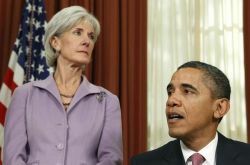 (Photo: Reuters / Kevin Lamarque)U.S. President Barack Obama (right) and Secretary of Health and Human Services Kathleen Sebelius are see in the Oval Office of the White House on Ocotber 31, 2011. U.S. Catholic bishops say proposed rules by U.S. health officials last week may address only one of several concerns that they have with a law that requires employers to provide their employees with health insurance. These provisions include employers provide coverage for contraceptives, sterilizations and drugs that may cause abortions. Cardinal Timothy Dolan, president of the U.S. Conference of Catholic bishops said in a statement on Thursday that bishops "remain eager" for officials to assure them that they will not have to refer, pay for, or negotiate for the mandated coverage. Numerous Catholic organizations have sued the Department of Health and Human Services which is in charge of implementing the law. The law in question, the Affordable Care Act of 2010, currently exempts "religious employers." The February 1 proposal by U.S. health officials sought to accommodate the desire by some religious non-profit organizations such as hospitals and universities to refuse to provide the coverage. Cardinal Dolan mentioned three areas of concern. The first is what he said was the law's narrow understanding of religious ministry. The second was compelling church ministries to fund and facilitate services such as contraceptives, including abortion-inducing drugs, and sterilization that violate Catholic teaching. The third was the disregard of the conscience rights of for-profit business owners. On February 7, the government's health department proposed a rule to implement the 2010 Affordable care act. While an exemption already exists for "religious employers" defined as only those who confine their activity to people of their faith, the proposed rules intended to accommodate any non-profit religious organizations, including religious hospitals or universities, that objected to contraception on religious grounds. The proposed rule would require the religious organization to give notice to their insurer. The insurer would then notify enrollees that it is providing them with no-cost contraceptive coverage through separate individual health insurance policies. For self-insured plans and student health plans, the religious organizations would provide notice to a third party administrator. The administrator would work with the insurer to arrange no-cost contraceptive coverage through separate individual health insurance policies. The Cardinal said the new proposal seemed to address the concern about the definition of a church ministry but said "the Administration's proposal maintains its inaccurate distinction among religious ministries." "It appears to offer second-class status to our first-class institutions in Catholic health care, Catholic education and Catholic charities. HHS offers what it calls an 'accommodation' rather than accepting the fact that these ministries are integral to our church and worthy of the same exemption as our Catholic churches," the Cardinal said. Another concern the Cardinal articulated was that the government "would require all employees in our 'accommodated' ministries to have the illicit coverage—they may not opt out, nor even opt out for their children—under a separate policy." Cardinal Dolan said that "because of gaps in the proposed regulations, it is still unclear how directly these separate policies would be funded by objecting ministries, and what precise role those ministries would have in arranging for these separate policies. Thus, there remains the possibility that ministries may yet be forced to fund and facilitate such morally illicit activities." He also said the proposal refused to acknowledge the conscience rights of business owners who operate their businesses according to their faith and moral values.